University Dental PC (Bayside) - Book Appointment Online! At Silverman & Associates, we value our patient relationships, making it our priority to deliver the gentle and compassionate care that you deserve. We work hard to make you feel at ease by providing exceptional patient care in a relaxed, convenient atmosphere. We strive to develop lifelong relationships with our patients by combining the latest dental technology with a professional and caring staff. The result is a beautiful, healthy smile that lasts a lifetime. 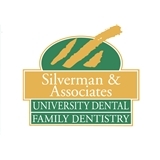 At Silverman & Associates we know every person’s dental needs are unique. That’s why we offer a comprehensive selection of treatment options in a comfortable, convenient atmosphere. Whether you are looking for information on preventive care, family dentistry, crowns, veneers, dental implants, invisalign, or teeth whitening, you can learn more about all of your options from our services and patient education pages. We’re confident we can provide superior dental care that no other dentist can offer. We specialize in improving smiles. For your convenience, you can also request an appointment online and download patient forms directly from our website. We are proud to offer two convenient locations, one office is in Bayside & the other in Bellmore to serve you and all your dental care needs. Feel free to contact either of our offices with any questions. We look forward to making each visit to our office a positive experience. Dr. Matt does a great job. Happy to have him taking care of my dental work.